Everyone sweats. Let's get that statement out there. However as a 14 year old girl, I was self conscious enough already without having to worry about why my anti-perspirant wouldn't work. Black sleeveless tops dominated my wardrobe and there was always a bottle of perfume in my handbag to mask any potential body odour. Despite my efforts, I felt there was no escaping the sweat patches and the anxiety of trying to hide them always made the situation worse until I realised there was something I could do about it. If you find regular anti-perspirant doesn't work for you, it's more common than you think and here's some solutions. Lets go straight to the solution which worked for me. If you suffer from excessive perspiration then I'd highly recommend Driclor. It's a special kind of roll-on which works by: "forming a gel matrix in the affected sweat glands, which reduces and eventually stops the flow of sweat." You simply apply the roll-on at night when your sweat glands are the least active and over time it eventually stops the excess sweating. At first glance it sounds really straight forward but I must warn anyone who is thinking about trying it about the pain it causes. When you first apply it, your underarms will burn. And please for the love of god do not shave your underarms on the day you apply it. You certainly won't do it again once you've experienced the pain of that. However over time your body builds up a tolerance to it and the pain doesn't last forever, just in the first week or so but I felt that that was sort of an indication that it was working. After about a month's use, gradually reducing the days in which I would apply it, my sweating issue was completely solved. I no longer had sweat patches or was self conscious that I smelled bad. I could wear long sleeved tops and my wardrobe could be introduced to some colour (though let's face it, black clothes all the way). 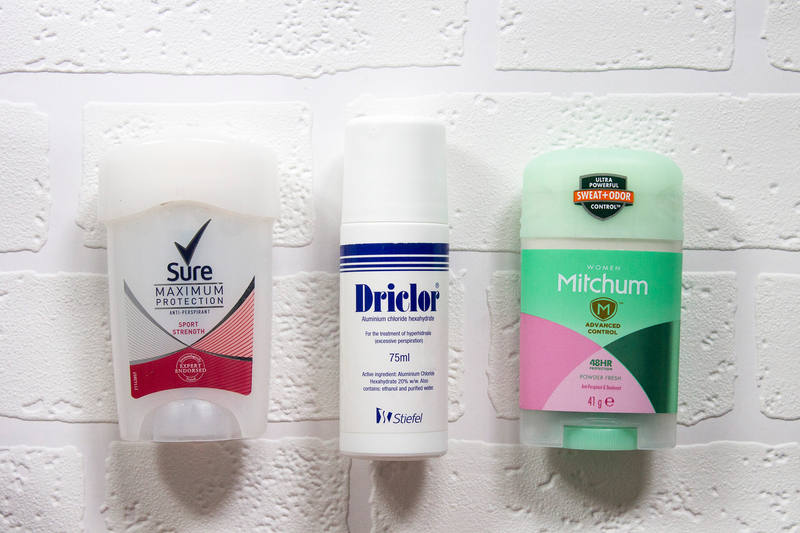 While I no longer rely on Driclor, I'll occasionally use it as a top up around 2-3 times a year but I thought I'd share some of my favourite anti-perspirants which I've found extremely effective. First up I love the Sure Maximum Protection range. There's quite a few different kinds but if you're unsure, the original scent is probably the most effective in my opinion but I do enjoy the Sport kind. However if I had to pick one anti-perspirant to use on a daily basis, it has to be the Mitchum Advanced Women 48HR Protection Powder Fresh Anti-Perspirant. It smells great and I've found it to be the most effective one I've ever tried. I tend to prefer the stick kind rather than sprays or roll-ons as they feel more comfortable and more effective as it's applied directly onto the skin. That is my experience with excessive sweating! I was unsure about writing this post for a long time however I realised that this would have been extremely helpful and reassuring to my 14 year old self, and hopefully this could help others who have been going through the same thing. If you're concerned about sweating, please speak to your doctor or pharmacist, you don't need to suffer in silence. If anyone relates to this story, feel free to share your story in the comments below.